Punchboards were originally used in the 18th century for gambling purposes. A local tavern owner would construct a game board out of wood, drill small holes in it, and fill each hole with a small paper ticket or game piece. The holes were then typically covered with paper or foil. After a patron bought a chance at the punchboard, he would puncture one of the hole’s paper or foil covers with a nail and retrieve the ticket/game piece. If the game piece contained a winning number, the patron won the prize. In the nineteenth century, board operators eventually drilled into their own holes (they knew where the big money was, because they made the board). The punchboard’s use started to decline. In the late 1800s, a new type of punchboard was introduced. This one involved putting paper in both the front and back of the hole (to help prevent operators from cheating). These new punchboards became popular purchases at drugstores, and they were sold with a metal stylus. The punchboard soon became increasingly similar to today’s lottery tickets. Soon, the punchboard became cheap and easy to assemble, and the industry flourished. Noted gambling author John Scarne estimates that 30 million punchboards were sold in the years between 1910 and 1915. He also estimates that 50 million punchboards were sold in 1939 alone, during the peak of their popularity. Three of the more interesting “Vintage Gambling Punch Boards” we have found over the years. These 3 feature WW2 themes which 1 now considered insensitive or non PC (Sock The Jap) – One called “Sock The Jap” featuring an exaggerated Japanese Soldier Illustration, The Punch Hitler version showing Hitler with horns and red devilish eyes along with 4 soldiers, And another with Hitler and those 2 other communist leaders illustrated with Uncle SAM standing in. 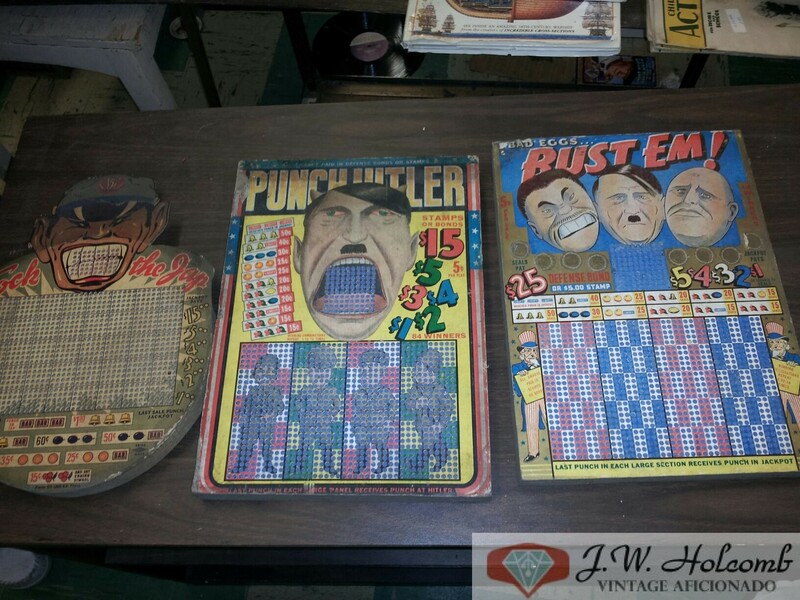 These types of ww2 punch boards are very rare and hard to find. The ones we found were not used “Punched” and had the original punch tool attached. Along with this trio we found over 150 other boards featuring pin-ups, cowboys, indians, cars, toys, and more. We foud all of them in a long-time hoarder/antique dealers estate.